The six legendary phoenix tablets have been stolen, and until they're found, the Galactic Games cannot begin. It is up to you as the Tetra Questrian to travel to the dangerous TetraDome in search of the six tablets that have been broken into 64 pieces and hidden throughout the 384 sections of the Tetroid's world. I guess that'll teach us all not to invite the Tetroids to the Galactic Games, huh? Tetra Quest is another example of how an old concept can be turned into something new and special if the right person sets his mind to the task. When all is said and done, Tetra Quest is really nothing more than a maze game. You have to find your way from one screen to the next in order to get four coins (four pieces of the tablets). But because of the interesting way you travel on and between each screen, the search for the coins becomes an absorbing and challenging venture. 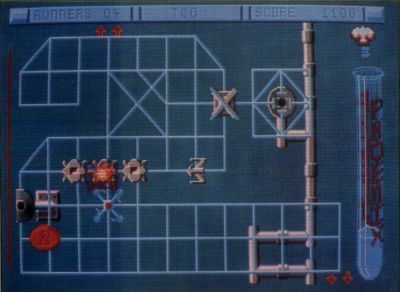 Each level of the game is made up of a series of screens that are interconnected. Some sections of the screens may be reached simply by traveling on the "limbs," a complicated gridwork. Other sections of the screens may be reached only by using gate switches, teleports or by changing yourself into a phoenix and flying to the area you want to reach. As a phoenix, your travels are no longer limited to the grid. The switches control gates that provide access to different parts of the grid. In order to get to these parts, the gates must be in the right positions. To further complicate the matter, the only way you can know which switch controls which gate is to experiment. And just to make sure you've got a real challenge on your hands, many of the switches control gates on other screens. In other words, you must trigger the switch, and if nothing happens on your current screen, you must make your way through the other screens, trying to see which switch has changed position. Teleports are easier to use, but can be just as confusing. Once again, the only way to know how they work is to experiment. Moving into a teleport (they look like funnels) causes you to vanish from your current location and reappear somewhere else. You may reappear on the same screen, or you may find yourself several screens away. The only way to successfully make your way through the maze is to memorize where each of the teleports go and to carefully note which switches control which gates. Luckily, Tetra Quest supplies the player with the ability to transform himself into a phoenix and thus gain the ability to move anywhere on the screen, in complete disregard of the grid. This is a handy way to get somewhere fast, but the power to do this transmutation is limited: You must have the right amount of "phoenix life," the current level of which is shown in a power tube on the right-hand side of the screen. Each time you change to the phoenix, the power goes down. Most of your time in Tetra Quest, however, will not be spent using one of the special transportation devices described above. You will be forced to manuever your Tetra Runner on the grid itself, avoiding the nasty creatures being generated by the "Splitter." These creatures (they come in many varieties) will quickly home in on you just like the ghosts in Pac-Man; and if you're to survive to the next level, you must use your guns to make sure that none of them comes near you. Each level of Tetra Quest (there are supposed to be 96 levels, but / sure never made it that far) is made up of four screens, each of which contains one of the four coins you must obtain. Each of the coins has a number, and you must retrieve the coins in numerical order. This, combined with the gates and teleports, definitely makes for challenging play. If there is a problem with Tetra Quest, it is the joystick response. Just as with most games that force the player to travel a grid-like path, manipulating your movement using the joystick can be frustrating, especially when moving diagonally. The speed at which your Tetra Runner moves increases the difficulty even further. It is lightning fast, and you can make it from one side of the screen to the other in a blink of the eye. If you find yourself traveling the wrong limb, it's difficult to change your direction before disaster strikes. All things considered, Tetra Quest, with its nicely drawn graphics, interesting sound effects and engaging game play, belongs in every ST gamer's collection. You won't be disappointed.